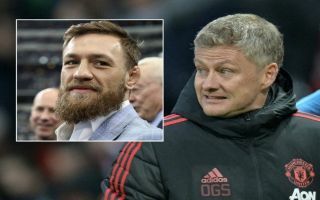 Conor McGregor is a self-confessed Man Utd fan, and he has now revealed which two players have impressed him most under Ole Gunnar Solskjaer. The Red Devils have been resurgent under their interim boss following his appointment in December, as they have battled their way back into contention for a top-four finish in the Premier League. Although they suffered disappointment in the FA Cup after reaching the quarter-finals, they will hope to produce a shock when they face Barcelona in the Champions League to keep their hopes of winning a trophy alive this season. Nevertheless, McGregor has been speaking about his boyhood club, and the UFC superstar revealed his respect and admiration for Paul Pogba and Marcus Rashford in particular as he evidently keeps up with the latest goings on at United. “Paul Pogba and Marcus Rashford have been particularly outstanding under him [Solskjaer]. They are young, confident and fearless athletes who believe in their abilities,” he is quoted as saying by the club’s official site. It’s difficult to disagree with McGregor’s assessment of the Man Utd duo, with both flourishing in particular since Solskjaer took charge. However, it will mean little if the club don’t achieve their objectives this season and so they face a crucial few weeks to determine whether or not Solskjaer has indeed made a huge argument to be announced as permanent boss this summer. McGregor though clearly has no doubts over who the right man for the job is. Ole Gunnar is a special man! I think he’s done an incredible job with United. They have to give him the job permanently. You can feel the pride and passion he has for the club and its history, and see the players honoured to wear the Red Devils crest under him. He’s really got the players performing.